Y’all heard about this Hamilton thing? But we kid the entire internet (or, as it’s now formally known, The Lin-Manuel Miranda Appreciation Society). 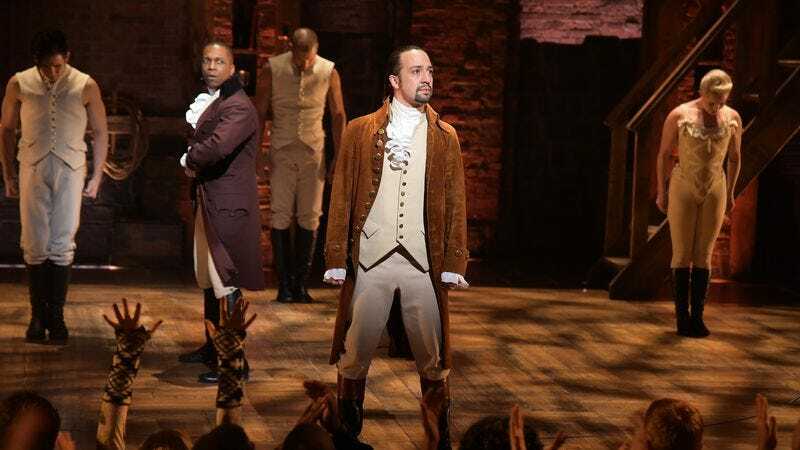 Miranda’s hip-hop dramatization of the life of Alexander Hamilton is a veritable pop culture sensation, inspiring parodies, bringing in massive box office receipts on Broadway, and earning Miranda the 2016 Pulitzer Prize for Drama. Hopefully he’s still got some trophy case space left, though, because the Tony Award nominations came out today, and Hamilton just shattered the record for nominations for a Broadway show. The play earned a landmark 16 nominations, which is more awards than the Tonys even offer for musicals; Miranda’s opus netted a nod in every category it was in contention for, plus multiple nominations in the acting categories. Miranda himself is nominated for three awards, for book, score, and his performance in the title role. The latter is the only one he might conceivably lose, too, facing off against co-star Leslie Odom, Jr., who plays Hamilton’s friend-turned-nemesis, Aaron Burr. Meanwhile, Daveed Diggs, Jonathan Groff, and Christopher Jackson—the Marquis De Lafayette, King George III, and George Washington, respectively—are battling it out for Best Featured Actor, Phillipa Soo was nominated for her leading role as Eliza Schuyler Hamilton, and Renée Elise Goldsberry was tapped for a featured role as her sister, Angelica. Honestly, we’re kind of surprised Miranda didn’t get nominated for a Lifetime Achievement Award, too, even though he’s only 36. You can see the entire slate of 2016 Tony nominations on the award ceremony’s web site, here, or get “My Shot” stuck in your head for the billionth time by clicking on the YouTube video below.